A year ago, if a seer had told Avenette Tennema Sirleaf that she would become a celebrity in Nigeria, far away from home in Liberia, perhaps she would have shrugged it off in disbelief. 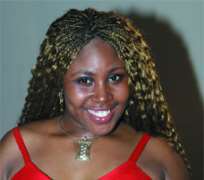 But last November, Avenette became a star as she came tops in the season three of the Next Movie Star reality TV show. And just last Sunday, as part of her grand prizes, the 26- year-old actress not only drove away in a brand new Kia Rio, she also smiled to the bank with a whopping 5,000 US dollars. Having gone through many rigorous activities in the NMS house, Avenette had expressed shock and disbelief when she was announced the winner of the competition last year. But after getting herself together, the fair-complexioned screen diva said it was a dream come true and went ahead to dedicate the moment to her late parents. “I feel so happy and honoured. It's wonderful. I am excited and the whole of Liberia will be happy for me and be proud of what I have achieved for them, I thank God. Liberia has been down for so long due to war, not been able to showcase the talents we have. Now, we are back on track, my emergence as winner of the Next Movie Star is a testimony. It is a dream come true for me and for the memory of my parents who are both late,” she said. On Sunday, Avenette, who came tops among 17 contestants drawn from Nigeria, Sierra Leone, Ghana, Gambia and Liberia, was all smiles and could not hide her joy as the prizes were presented to her by two entertainment journalists, Tosin Ajirire of The Sun and Ayo Lawal of PM News. On her plan for the prize money, Avenette said she will first of all pay her tithe and then invest the rest. “I'll pay my tithe because God has done a miracle for me. Then, I'll invest the rest in a tangible business.” She declared. The first and second runners-up, Zerziya Jonathan Wilson and Wael Suleiman Muhieddine were each presented with a plasma television set and cash prizes.